Image courtesy of Minnesota Historical Society Press. Good books help readers see the world in a new way. Often, what we thought we knew or understood so completely is revealed in a different and fascinating light. We look up from the page with fresh eyes at a world transformed. 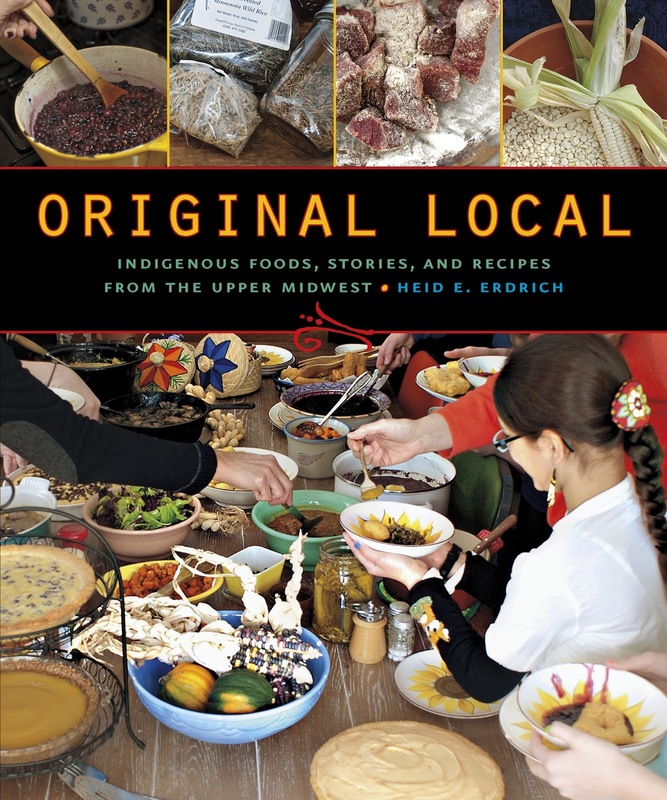 Original Local: Indigenous Foods, Stories and Recipes from the Upper Midwest by Heid E. Erdrich is exactly that kind of book. Poet, scholar and now cookbook author, Erdrich provides a classic Midwestern menu of casseroles, breads and salads akin to but different from those found in church suppers across the region. Using familiar indigenous ingredients (maple, corn, cranberries, walleye, and turkey) as well as the somewhat unfamiliar (sumac, chokecherries, sunflowers, rabbit, and quail eggs), she not only brings the Great Lakes landscape to life in a whole new way, but escorts it into the kitchen where it makes itself right at home and starts cooking up a storm. Erdrich, food-loving writer that she is, puts storytelling at the center of this work alongside the ingredients. "A recipe is a story," she writes in the introduction. "It suggests the characters (or understudies in the form of substitutes) and narrates how the whole came from parts." Between recipes then, she includes quotes, legends, tales, articles, and conversations. Many are authored by others and these voices tell of farms, stores, and seed regeneration programs striving to preserve Native food traditions. Readers also join her family gatherings large and small to hear classic fishing and hunting tales similar to those from my own Wisconsin family table. Divided into seven sections - manoomin (wild rice), fish and game, gathering (think parties and family meals, not foraging), vegetables and beans, mandaamin (corn), maple and berries, and herbs and tea - the book also includes resource sections to help readers find ingredients and learn more about indigenous people. Detailed recipes offer clear instructions that often contain humor and useful caveats. Ingredients, however, are not limited to only the indigenous, but include things like feta cheese, lemons, or pineapple. With a nod to the various places and mixing of cultures that we all come from, Erdrich is clear that her goal is not to be a purist: "Honoring the spirit of our ancestors and the foods that made them strong so we could be here today is more important than strict adherence to indigenous ingredients alone. After all, tribal people of the Great Lakes and Great Plains never turned down good food, no matter where it was from - of that I am sure." Original Local is by turns funny, moving, inspiring, and thought-provoking as stereotypes of Native American culture are dismissed. Readers hankering for new dishes, ways to explore local ingredients, or even just looking for something tasty to whip up for a hungry household will find all that and more in these pages. Erdrich provides a much-needed and wonderful addition to Midwest kitchens as well as the local and sustainable food movements across the country. The results are more than a little good food and a better understanding of the place we call home. My pleasure! I've got another one in my review pile, too, from the Sioux Chef. It's a bit more high brow in presentation, but still a collection of amazing stuff. I find it so exciting and interesting to read about. I feel like there is a whole world of foods that have been dismissed or ignored due to ignorance of all kinds. It is simply thrilling to find these books now.